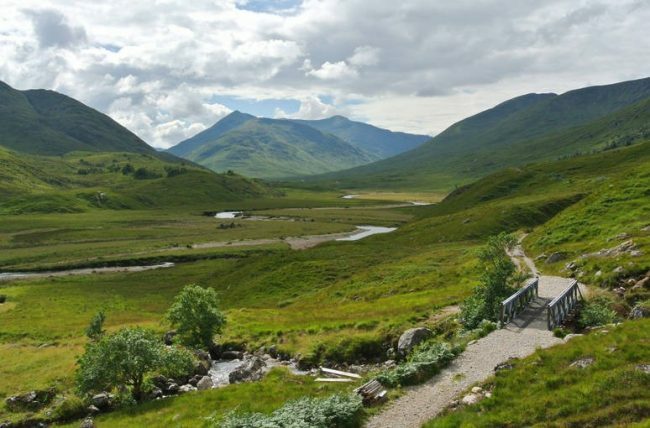 West Affric lies on the eastern border of two of our other estates – Kintail and Glomach – and includes part of the old drove road from Skye to Dingwall, now a popular long-distance Highland hill walk. This is part of a network of remote footpaths on the estate, which provide access through the glen and onto the mountains that are cared for by the National Trust for Scotland. West Affric is situated at the western end of Glen Affric National Scenic Area, a vast region of wild and beautiful land which has much to offer visitors, with its native forest, beautiful lochs and rugged moorland. Bare mountain crags stand out with startling clarity, while the spongy moorland underfoot makes perfect terrain for rambling. The National Trust for Scotland bought West Affric in 1993. We’re helping to repopulate the land with native plants and trees – so far birch and rowan have begun to re-establish themselves. Birds are also increasing in numbers, including black grouse and willow warbler.